More than 75 students from Upper St. Clair High School visited Point Park University March 7, 9 and 14 to learn more about the forensic science field and investigate mock crime scenes in the CSI House on campus. After researching forensic science-related field trips, Tracey Vacco, academic chemistry and forensic chemistry teacher at Upper St. Clair High School, chose Point Park and its CSI House. "I thought this would be good hands-on experience for my juniors and seniors who are studying forensic chemistry. I also wanted to expose them to the college atmosphere," Vacco said. Point Park forensic science majors and Edward Strimlan, M.D., assistant professor and coordinator of the forensic science program, set up the mock crime scenes and then guided the students through the investigation, which included teaching them how to sketch and photograph crime scenes. 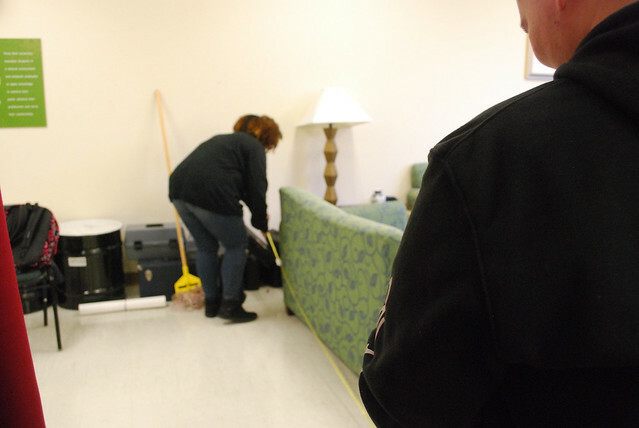 Following the investigations, Strimlan and his students talked about the courses offered in the forensic science program at Point Park and career opportunities in the field. "The students from Upper St. Clair High School are already studying forensics in their science classes so they all seemed fascinated with how forensic science is the application of science to law. They were able to directly apply what they've been learning in high school to the mock crime scene investigations they conducted at the CSI House," Strimlan explained. Upper St. Clair High School senior Michael Besser said: "It was interesting to process multiple pieces of evidence and draw connections between them to determine what actually happened." "It was exciting to go through the process of investigating a crime scene and learn about the different careers in forensic science. I'm really interested in forensic pathology and glad that Dr. Strimlan gave us a look into that career path," said Bess Gillece, a junior at Upper St. Clair High School. Gianna Chimento, also a junior at Upper St. Clair High School, added: "I enjoyed learning about what all the branches of forensic science do and how there are many career options with a forensic science degree." "This was an opportunity for me to apply what I'm learning in class to help high school students know more about forensic science," said Philippines native Clarence Rachel Villaneuva, a sophomore international student and forensic science major, who graduated from Samoana High School in Pago Pago, American Samoa. Senior forensic science major Amanda Mills from Middletown High School in Middletown, Md., told the students: "You have to love science to be in this field. I love forensic science. It's challenging, but definitely a lot of fun. I wouldn't change being in this major for anything."